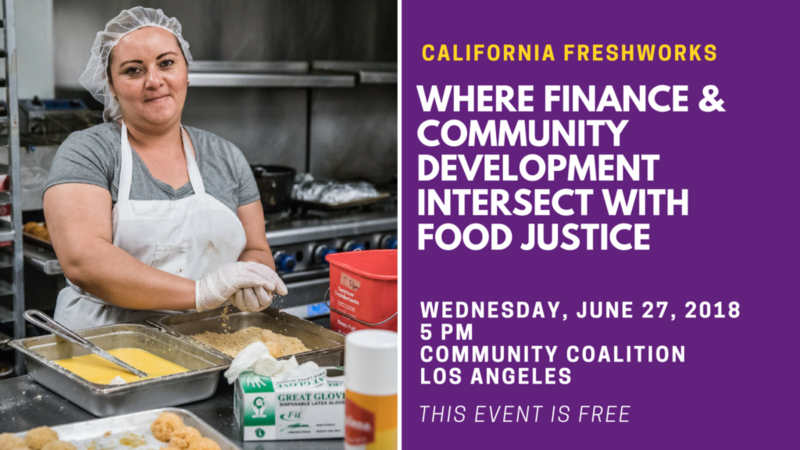 Join us in Los Angeles for a panel conversation to learn more about California FreshWorks and the way in which the program pairs financing with tools and services that help enterprises overcome barriers to financing and build their capacity to sustain a successful business. Examples include credit enhancements that improve the risk profile of a small business and technical assistance that builds business capacity and is responsive to the unique needs of each project and enterprise. We will highlight two organizations working to increase access to healthy foods and promote economic development throughout Los Angeles: L.A. Prep and Community Services Unlimited. L.A. Prep is a kitchen facility where small food enterprises spend their time making good food and scaling their businesses without having to be experts in health code and real estate finance. L.A. Prep now hosts 50 unique food businesses in a shared commercial food manufacturing facility along with LA Kitchen, a lauded food justice project. With the support of FreshWorks financing, L.A. Prep opened in 2015 with 50 single business production kitchens, flexible cold and frozen storage, a demonstration kitchen, co-working space, and a staffed warehouse to help businesses with receiving and logistics. Today, the L.A. Prep facility supports 270 local jobs, two-thirds of the participating enterprises are women-owned, and one-third are minority-owned. Based in South Central Los Angeles, Community Services Unlimited fosters the creation of communities actively working to address inequalities and systemic barriers that make sustainable communities and self-reliant life-styles unattainable. Through its 40 years, the organization has run successful programs ranging from senior health to affordable and environmentally sustainable transportation. In 2004, the organization developed food system programming to address local food security needs and in 2015 purchased the Paul Robeson Community Center, a 5,000-square-foot commercial building located at the intersection of S. Vermont Street and W. 66th Street. With FreshWorks support, Community Services Unlimited is developing the building into a wellness center that will include a produce market, cafe with commercial kitchen and cold storage space, and nonprofit offices.